Here are some other resources you might like to help you get started making and soldering. If you have a Learn To Solder Kit, here are the directions for the Learn to Solder Kit. If you are brand new to electronics, see our free tutorial Breadboard Circuits 101. Also available is Breadboard Circuits 102 – 555 Timer. *Disclaimer: This page contains affiliate links. I might make some beer money if you click through and purchase. Our current go to soldering station is a Weller WLC-100. We have had it for several years it it still works great. The Weller WLC-100 soldering station is a great for beginners. It has 40 watts of controllable temperature. Usually found for under $50. The Hakko FX-888D is a step up from the WLC-100. It has a digital readout for the controllable temperature. 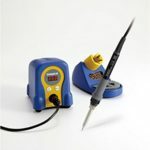 The 70 Watt soldering station goes up to 900° F. Usually costs around $100. If we needed a new station this is the one we would try. The Weller WESD51 is comparable to the Hakko FX-88D and has a digital readout and is temperature controllable. Has the ability to lock in the temperature so you don’t accidentally change it. Which one you like is really personal preference. Can be found for just under $140. Here are books we have actually bought and used when we started out making electronics. They all have great projects to work on and make excellent gifts. Excellent book for beginners in electronics by Charles Platt, now in a second edition. A complete electronics course with tons of experiments by well known author Forest Mims III. A microcontroller is a small computer that controls things like your refrigerator or dishwasher. Here are some you can use to make things with. Microcontrollers allow you to make leds blink, spin motors and many more things. 1. Arduino Uno R3 – Your basic microcontroller from Arduino. If you haven’t used one before the Uno model is the best place to start. 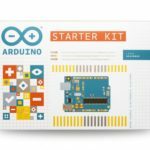 Or get started with the official Arduino Starter Kit. Contains an Arduino Uno, parts and book for 15 projects. 2. Arduino MKR1000 – Effortless WiFi in a very small package. Same great Arduino software interface. 3. Jeenode – Great Arduino compatible microcontroller with wireless radio built in. Buy two of these and they can talk to each other. They come as a kit and need to be soldered together. Not for the absolute beginner. 4. Raspberry Pi – Raspberry Pi 3 Model B Motherboard The latest model is really a small computer you program for various things. Making a retro arcade game controller sometimes called Picade is popular. 5. ESP 8266 – Very cheap microcontroller with built in WiFi. Can be programmed with the Arduino IDE. 6. 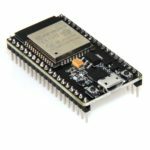 ESP32 – Similar to the ESP8266 but with built in Wifi & Bluetooth. Can be programmed with Arduino IDE.